The Ulmbach Dam (built in 1964/5) is located in the Lahn-Dill area, north of Frankfurt, Germany. It provides ﬂood protection and is also a tourist destination, attracting ﬁshermen, walkers and campers. Although the dam showed no signs of leaking, the client inspected the installation regularly in order to keep it maintained according to current technical and safety requirements. An inspection identiﬁed some minor issues with the dam face – partial cracks in the asphalt lining and weathering damage to the mastic protection layer. The leakage detection system also needed updating. Dense asphaltic concrete is dense, durable, ﬂexible and robust enough to resist mechanical, chemical or biological attack. It is also safe for humans. fauna or ﬂora, making it ideal for dam lining. However, like any other structure, after decades of operation, maintenance and rehabilitation is required. Experience has shown that bituminous linings in basal areas or areas permanently under water do not show any signs of ageing. The ‘water exchange zone’ – the area where the water changes height – is the area which over time may become weathered. This was the situation at the Ulmbach Darn so just the upper part of the dam and the surface of the dam face needed rehabilitation. The ﬂood protection function of the dam had to be maintained throughout the project so the dam had to remain secure the whole time. The dam crest is 280 m long and the slope area to be rehabilitated was 37 m long and measured 6,400 m2, with an incline of 1:1.8. The client also decided to improve the overall structure by reshaping the crest area, to reduce future maintenance costs. All the water was removed for the modernization and rehabilitation works, although the Ulmbach river continued to flow through the bottom outlets. WALO milled off 10 – 20 mm of the old asphalt seal, leaving 40 – 50 mm to keep the dam secure in case of a ﬂood. WALO installed a new controlled lining, including integrating an innovative stainless steel tube drainage system, which divided the dam into four sections for easy monitoring. This means any leaks can be readily located and the amount of leakage easily measured. 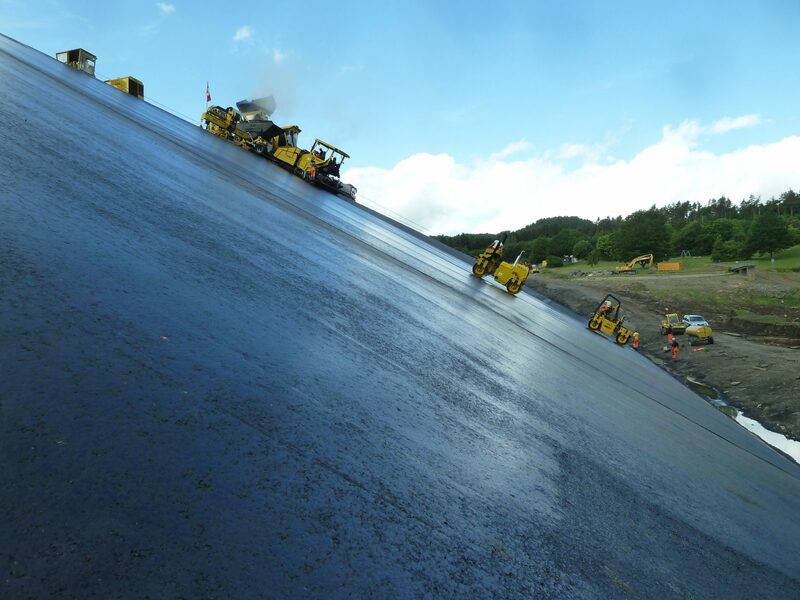 A new 80 mm asphalt binder layer and a new 60 mm sealing layer were installed using a slope paver. In addition, the joints to the concrete structures and crest were also renewed and a new wave breaker and guardrail were installed.